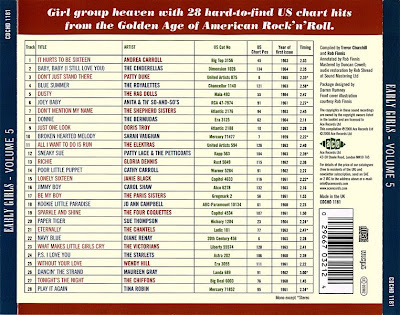 Almost 6 hours of wonderful songs of the Girl group heaven with 140 hits from the Golden Age of American Rock &amp; Roll. 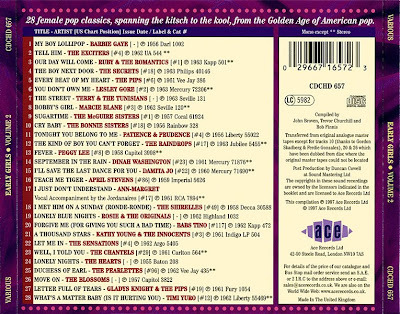 This impressive collection of recordings, laid down between the fifties and sixties, chosen by someone with excellent taste! 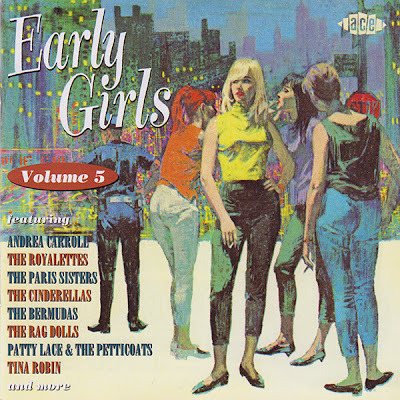 Terrific Early Girl group compilation. The girl group genre remains one of the most collectable in the reissue market and this compilation must rank as one of the strongest in the series and on the market as a whole since it mops up a lot of scarce lesser hits as well as some better known ones. Leave it to one of England's premier re-issue labels to put together a compilation that rivals Rhino's excellent "The Girl Groups" series. 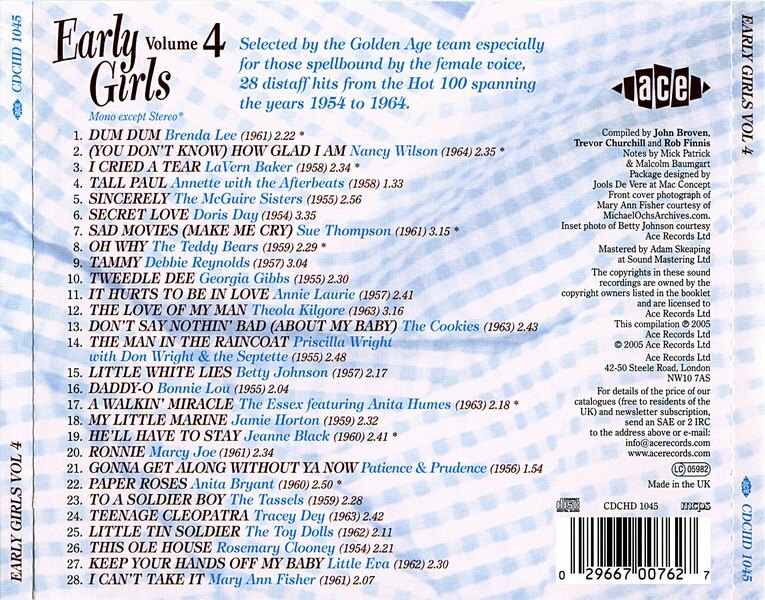 While a few of these songs fall outside the strict definition of girl groups (1961-1965), this is a super collection and at 28 tracks you won't find a more generous single disc compilation. 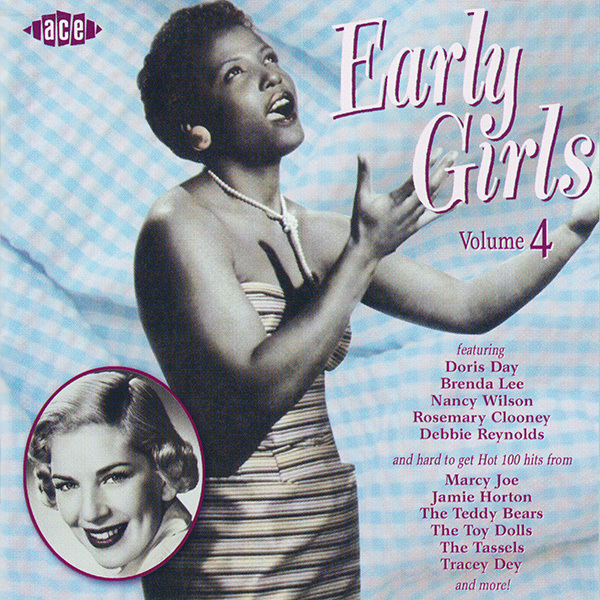 There are a few late Fifties hits: 13-year-old Dodie Stevens' "Pink Shoe Laces," Gale Storm's "Dark Moon," and the Aquatones' "You." The rest are early-Sixties classics and also-rans. 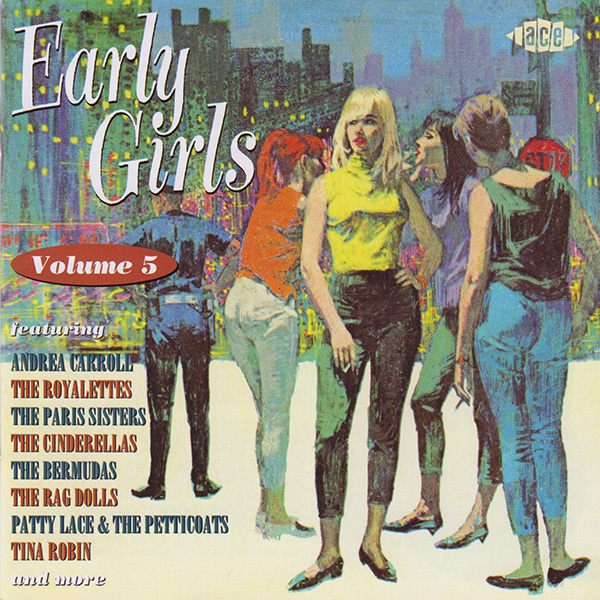 You get the Exciters' version of "Do-Wah-Diddy" (later a No. 1 for Manfred Mann), Betty Everett's "You're No Good" (which Linda Ronstadt took to No. 1 in 1975) and the Cookies' lead singer Earl-Jean's minor hit "I'm Into Something Good" (which would become Herman's Hermits' first U.S. hit). There are seven songs that overlap with the Rhino series, but that's a minor complaint. Where Rhino gave you the Angels' oft-anthologized "My Boyfriend's Back," here you get their earlier 1961 hit "'Til." While the Rhino series included three Shirelles' songs, it did not include their classic "Dedicated to the One I Love" found here. 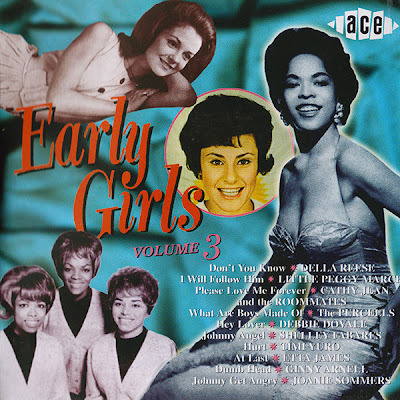 This Ace release also includes several artists not on the Rhino series: "The Name Game" by Shirley Ellis, "I Wish I were a Princess" by Little Peggy March, "I've Told Every Little Star" by Linda Scott, and Rosie &amp; The Originals' "Angel Baby." Don't think of this as a competing series with Rhino, but a companion series. And just like Rhino, you get crisp, clean sound and extensive liner notes on each of the songs and the artists. Early Girls Volume 2 continues this CD series with some mighty fine hits by some of the best female singers of the 1950s and 1960s. These songbirds could take anything and make it shine brighter than silver and gold; that's why CDs like this still sell! The quality of the sound is excellent and I really like that artwork, too. Barbie Gaye starts the CD track list off with her big hit entitled "My Boy Lollipop." "My Boy Lollipop" is quite catchy and Barbie sings this with all her might--she really belts it out! Barbie's voice is as clear as a bell and the music fits perfectly with her singing. The Exciters do a wonderful job on "Tell Him;" "Tell Him" really sparkles and The Exciters do this with their incredible sense of timing; "Tell Him" is a masterpiece--and it's also rather catchy, too. "Our Day Will Come" by Ruby &amp; The Romantics is clearly another winner; Ruby &amp; The Romantics do this one up right! They sing, harmonize and sway gently to make this tune really fine. The percussion enhances the music, too. Listen for Little Leslie Gore to do her outstanding hit, "You Don't Own Me." "You Don't Own Me" still gets airplay on the "oldies" radio station in my area; Leslie sings this faultlessly and that's terrific. Leslie's voice remains distinctive; she has incredible talent and "You Don't Own Me" showcases her talent. Marcie Blane does "Bobby's Girl" with a lot of feeling that really enhances this tune; she sings this very well; Marcie remains a great chanteuse to this day! The McGuire Sisters also do their usual top notch job on "Sugartime;" and those male singers in the background balance out the number very nicely. "Tonight You Belong To Me" by Patience and Prudence was always one of my very favorite songs from this era and genre of music; Patience and Prudence harmonize to perfection and although their career was short they gave us so much to enjoy. In addition, what can I say about Peggy Lee's incredible hit "Fever?" "Fever" was one of Peggy's signature songs and just one listen proves she owned this song--what a performance! The percussion makes "Fever" even better. There's also the great Dinah Washington doing "September In The Rain;" Dinah was a giant amongst giants and I treasure her CDs in my collection. Damita Jo's "I'll Save The Last Dance For You" is very strong; and "I Just Don't Understand" gets the royal treatment from Ann-Margret and The Jordanaires. Great! 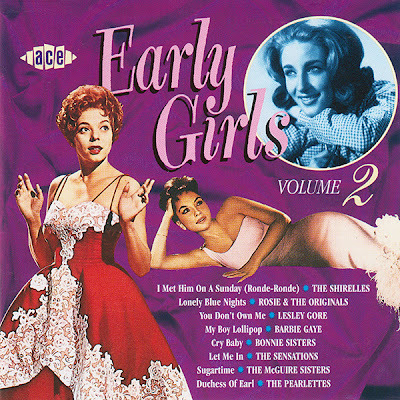 Babs Tino sings "Forgive Me (For Giving You Such A Bad Time)" with lots of positive energy; and there's another gem in "Duchess Of Earl" as The Pearlettes do a female version of "Duke Of Earl" by Gene Chandler. Gladys Knight &amp; The Pips perform "Letter Full Of Tears" without letting go of a superfluous note; and the CD ends very nicely with Timi Yuro doing "What's A Matter Baby (Is It Hurting You)." Wow, Timi sure does this brilliantly. This will leave you wanting more! 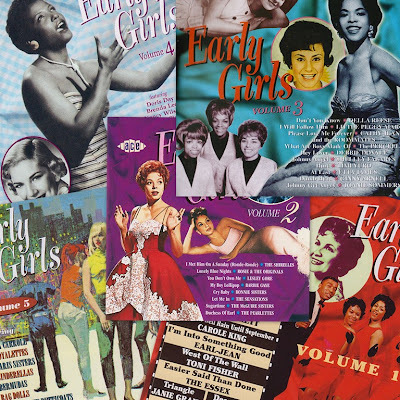 Early Girls Volume 2 offers us great, great music by some of the very best songbirds and girl groups of the 1950s and early 1960s; and that's very valuable for fans of this genre of music. This third release in their Early Girls series continues the mix of relatively easy-to-find selections and a few that will immediately grab the attention of collectors everywhere, especially those who concentrate on the Girl Group Sound. It starts right off with one that became the only hit for an L.A.-based trio that included Nannette Jackson, Gloria Goodson, and Carolyn Willis, who also sang with Bobb B. Soxx &amp; The Blue Jeans and The Honey Cone. Written for them by David Gates of Bread, My One And Only Jimmy Boy peaked at # 49 Billboard Pop Hot 100 in December 1963/January 1964 on the Colpix label, becoming just one of many otherwise nice tunes shoved aside by the onslaught of the British Invasion. Three more One-Hit Wonders you don't see in many releases are Alice Faye Henderson, Ginny Arnell, and The Percells. Alice, while working as a maid, was discovered by the next-door neighbour, Stephen Schlaks, who also happened to own Bardell Records. In the summer of 1963 she cut He's Mine (I Love Him, I Love Him, I Love Him) under the billing Alice Wonder Land and saw it reach # 62 Hot 100 that September. Arnell, from New Haven, had her only hit, Dumb Head, top out at # 50 Hot 100 in December 1963 on one of the major labels, MGM, while The Percells (lead Gail Jones, Joan Paulin, Jean Marie Johnson and Betty Lloyd) from Long Island, N.Y., had What Are Boys Made Of? make it to # 53 Hot 100 in April/May 1963 on ABC-Paramount. The real find, however, is I Want You To Be My Baby, a # 18 Pop Top 100 in September 1955 for Lillian Briggs (orchestra backing by O.B. Masingill), a vocalist/trombone player discovered by the legendary Alan Freed while she played with Joy Cayler's All-Girl Orchestra in New York. Released on Columbia's Epic subsidiary, that was her only hit as well. The Pixies Three, on the other hand, had four hits to their credit, with the best for this Hanover, Pennsylvania trio was their first, Birthday Party, which reached the Hot 100 Top 40 at exactly # 40 in late summer 1963 on Mercury. Group members were lead Midge Bollinger (replaved by Bonnie Long in 1964), Kaye McColl, and Debbie Swisher, who would take over from Peggy Santiglia as lead of The Angels in 1967/68. 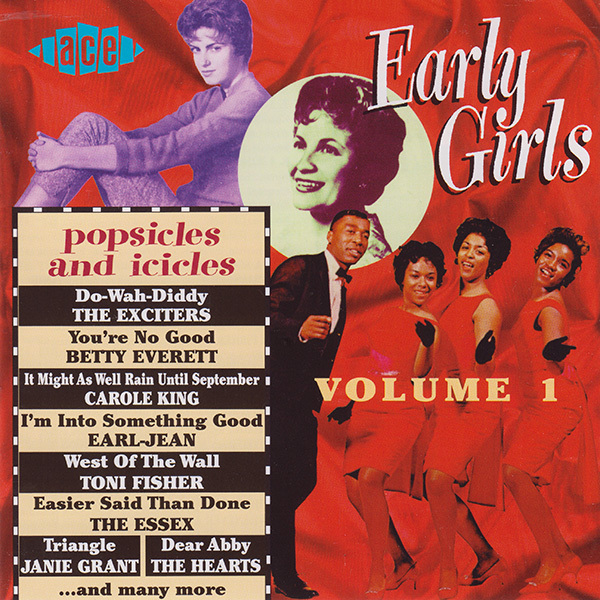 The Starlets from Chicago (lead Dynetta Boone - also known as Liz Walker - Maxine Edwards, Mickey McKinney, Jane Hall, Bernice Williams and Jeanette Miles) is another group generally associated with One-Hit Wonders, with Better Tell Him No hitting # 24 R&amp;B and # 38 Hot 100 in May 1961 for the PAM label. However, while still under contract to PAM, they also recorded I Sold My Heart To The Junkman for Newtown Records and they, in order to avoid a lawsuit, released it as by one of their own groups, The Blue-Belles, led by Patti LaBelle. In May 1962 it peaked at # 13 R&amp;B/# 15 Hot 100. Debbie Dovale was, however, a member of that ignominious group with her only hit, Hey Lover, reaching # 81 in November 1963 on Roulette. One selection here, What Kind Of Girl (Do You Think I Am?) by Gigi (Griffin, nee Marian Jackson) and the Charmaines was never a hit. In fact, this Cincinnati trio never had a Pop Hot 100. But, like The Blossoms (see Volume 1 in this series), they did memorable background work with major stars like Gary U.S. Bonds, James Brown, Lonnie Mack, Bobby Freeman, Little Willie John, and Country artists Conway Twitty and Hawkshaw Hawkins. 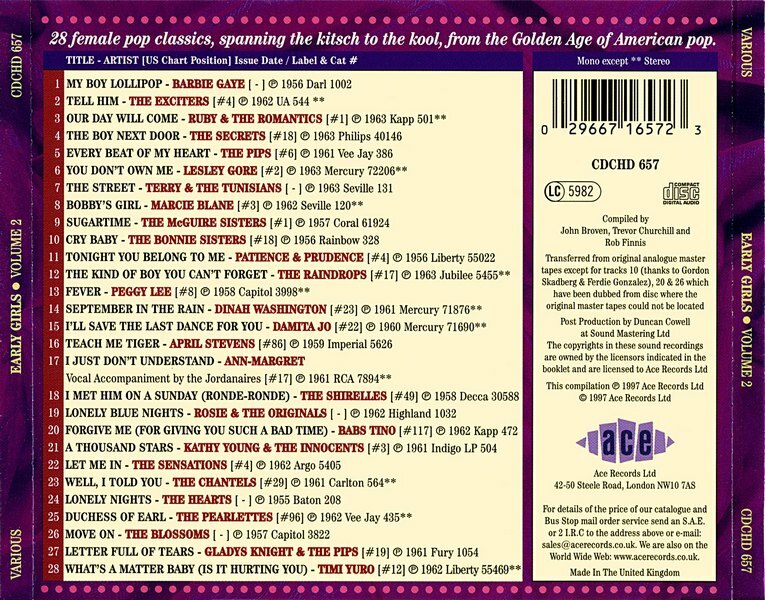 Topping it all off are 22 pages of liner notes written in 2000 by Mick Patrick, complete with vintage poster/record reproductions and numerous photographs, including Lillian Briggs, Patti Page, Jodie Sands, Della Reese, Etta Jones, Shelby Flint, The Starlets, Timi Yuro, The Charmaines (rare), Shelley Fabares, Joanie Summers, Little Peggy March, The Percells, Diane Ray, The Pixies Three, Ginny Arnell, The Girlfriends and Bernadette Carroll. 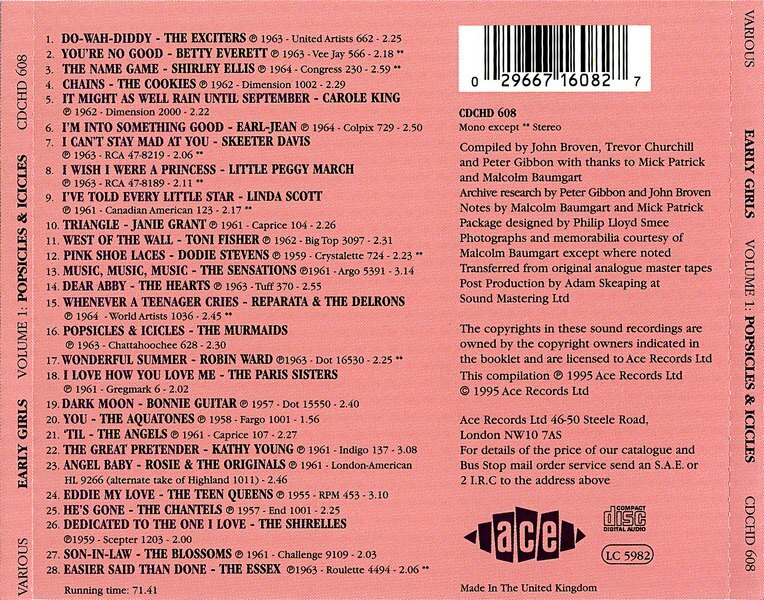 A discography of the contents appears on the reverse. 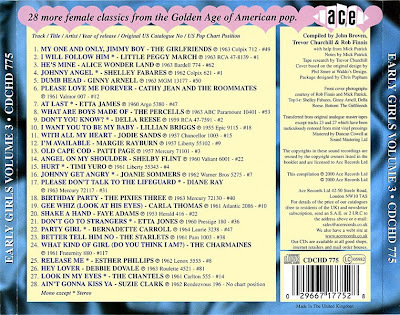 Here, in the fourth installment of their highly regarded "Early Girls" series of rock's golden-age girl and girl-group compilations, Ace extends their reach beyond the mostly teenager-oriented recordings of previous volumes. Sharing the digital domain with to-be-expected artists such as Brenda Lee, the Cookies and Tracey Dey are stalwarts of the more adult-oriented performers of the day as represented by Doris Day, Rosemary Clooney and Nancy Wilson. 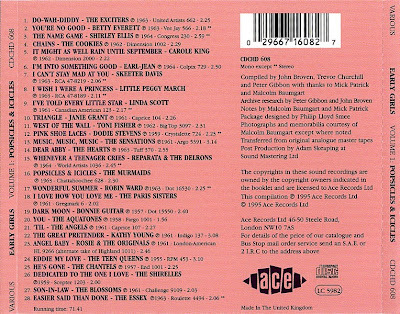 While one may argue they are misplaced in this compilation series, Ace is reminding us that, as their tunes were strong contenders within the top-100 of the period and they would not be going away quietly as many of their male counterparts did, they were indeed part and parcel of the female presence in the early days of rock and roll. So, here in this eclectic gathering we are presented "Secret Love" from Doris Day, "This Ole House" by Rosemary Clooney and Nancy Wilson's "How Glad I Am". But the focus here is still on the teenage market and the performers that aimed directly at that upcoming wave in the music world. A few of the quickly recognized big hits are here, represented by Annette's "Tall Paul", Sue Thompson's "Sad Movies" and the Cookies' "Don't Say Nothin' Bad About My Baby". Refreshingly, represented are a few artists that had monster hits, though the tunes selected here include some lesser-known one such as the Essex' "A Walkin' Miracle" follow-up to "Easier Said Than Done" and Little Eva's "Keep Your Hands off My Baby" riding the tailwind of her massive hit "Locomotion". What really piques the interest here however, is Ace's exceptional track record of bringing to the digital domain tracks that have seldom, if ever, seen the light of digital day. 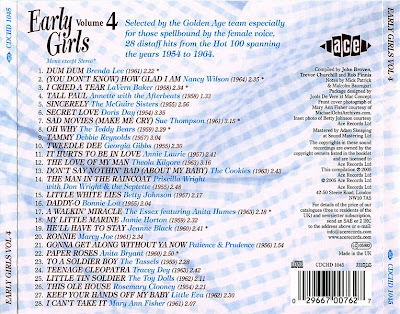 And there are many - "Oh Why" from the Teddy Bears of "To Know Him Is to Love Him" fame, Annie Laurie's "It Hurts to Be in Love", Marcy Joe with "Ronnie", "To a Soldier Boy" from the Tassels and the Toy Dolls' "Little Tin Soldier" to name a few. 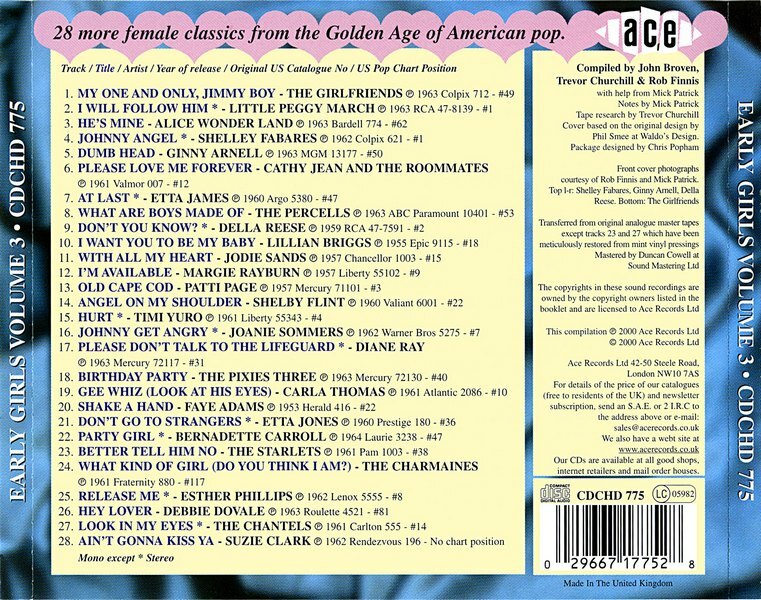 With a very generous 28 tracks all told, all in top-notch sound including eight tracks in true stereo (1-3,7,8,17,19 and 22) and a phenomenally comprehensive 24-page liner notes booklet, Ace has again hit an out-of-the-park home run with this, their latest girl-group compilation. No hesitation whatsoever here in adding this to the collector's must-have list. Another fine collection from the fanatics at Ace Records. An eclectic mix of known artists with low charted hits and some, at least to me, completely unknown ones. That said, everything on this CD is interesting. The usual great sound quality and the usual fantastic insert booklet. As with all Ace products and the Early Girls series, highly recommended. is there a possibility of a re-up? Excellent set of varied artists, great stuff which needs to be preserved for future fans of these classics!